Do you know your standards? Your standard drink that is! 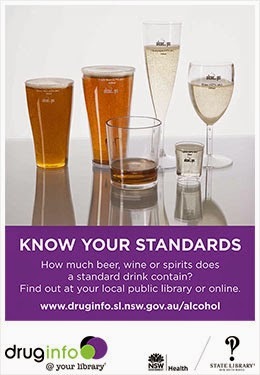 During June the NSW Public Library network will be promoting awareness of standard drinks and the Australian Alcohol Guidelines. Know Your Standards Month by hosting displays providing a range of free information to the community on standard drinks. Displays will include Standard Drinks pocket guides and pens,various pamphlets and other material. Visit Menai, and Sutherland Library during June. Stocks of free material are limited so get in early! So, how much do you really know about standard drinks? Alcohol concentration varies considerably with the type of drink. In Australia, beer contains 0.9 to 6% alcohol, wine 12 to 14%, fortified wines such as sherry and port around 18 to 20%, and spirits such as scotch, rum, bourbon and vodka 40 to 50%. How many grams of alcohol are there in a standard drink? According to the Australian Alcohol Guidelines, what's the maximum number of standard drinks a healthy adult should have in a day? (Answers: 10g / A 30ml nip of spirits, 100ml of wine, a middy (285ml) of full-strength beer / One hour although there is considerable variation between individuals / In Australia, all bottles, cans and casks containing alcoholic beverages are required by law to state on the label the approximate number of standard drinks they contain / To reduce the risk of alcohol-related problems over a lifetime a healthy adult should drink no more than two standard drinks a day.) Quiz courtesy of the State Library of NSW. For additional information on alcohol and other drugs, visit Sutherland Library's drug info @ your library collection for a range of quality pamphlets.